Traversing thick wilderness on foot is no small feat. Add heavy equipment and vehicles to the equation and the process gets even tougher. Now imagine encountering a swamp or other type of wetland directly between your team and your destination. No way under it, no way around it — better go through it. Mats provide a simple and practical transportation solution across soaked terrain. Cheaper and more time-efficient than building a bridge, mats create temporary transportation routes for those in industries such as forest management. If that’s you, and you’re wondering how to build a road through a swamp, read on to learn the basics of using mats in wetlands. Building on swampy land requires heavy equipment such as wheel loaders, forklifts, cranes and bobcats. The equipment you choose depends on the project at hand, and heavier equipment may require wider mats for increased weight distribution and maneuverability. Soil strength is another important factor to consider. The term “wetlands” covers a wide range of surface types, ranging from water to muck to clay-like surfaces. Crossings through water, muck or peat require larger mats that cover more surface area. While it might seem counterintuitive, larger mats tend to sink less, because there is less swamp mat weight applied to the area below. Keep an eye out for the clearest path available. Stumps and other obstacles that press into a mat can lead to warping or breakage. It may be necessary to blade the surface before laying down a mat. Only remove as much vegetation or debris as necessary as you plan out a straight path to cross. The grade of this terrain should not exceed 4 percent and it should have no cross slope. A flat, straight and debris-free crossing provides maximum traction for less vehicle slippage. Choosing the right path through a wetland is about more than making traversal as easy as possible. There are also decisions that make the difference between an environmentally-friendly crossing and one that damages the surrounding ecosystem. Ignoring environmental considerations is a mistake — damaged wetland natural habitats can take decades to fully recover and could lead to steep fines for businesses that damage public or private lands. If there is no way to get around vegetation at your wetland crossing, clearing small plants or bushes may be the only way forward. Be careful not to disturb the vegetation’s root system when clearing a path, in order to encourage plant growth once work is complete. The goal is to leave no trace behind, and doing so requires a careful approach to site alteration. The type of mat you choose can make a difference in the environmental impact of a project. In general, a lighter mat will affect the terrain less than a heavier option. Because of this, cross-laminated timber mats (CLT Mats) provide an environmentally friendly material for wetland crossings. These types of mats weigh half as much as standard timber mats, and have double the strength. 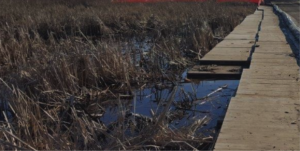 These ground protection mats for heavy equipment utilize solid-sawn lumber to create an incredibly durable surface that is ideal for crossing swamps or wetlands. When you’re ready to get your mat on the ground, how you assemble it largely depends on the type of mat you’re working with. Timber mats are heavier than CLT mats, and as such, require heavier equipment to lift and maneuver. All Viking Mats arrive pre-assembled, so you don’t have to worry about constructing each individual mat on-site. You can use cables to aid in the timber mat lifting process. Once the mat is on the ground, connecting slats together is simple. Cabled loops extend from one end of each mat panel, which connect together to secure the point of contact between mats. These mats are even easier to put together than timber. CLT mats are available with interlocking finger joints for rapid construction. What’s more, CLT mats are reversible, reducing downtime when it’s time to build a road. Whichever type of mat you choose, you can place a geotextile material below it to increase traction, water drainage and environmental-friendliness. Non-woven geotextiles provide the most reliable solution, but woven will work as well. Remember that soaked or submerged geotextiles can be difficult to remove, so use smaller pieces to make getting them out easier. 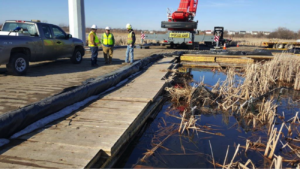 Wetlands present a significant transportation obstacle when moving heavy equipment, but not one that is insurmountable. With dependable mats at your disposal, you can get from Point A to Point B quickly and stabilize muddy soil no matter how rugged the terrain looks ahead. Want to learn more? Discover how our mats helped the U.S. Fish & Wildlife Service access a wetland pipeline for inspection in Michigan. The project required as little environmental impact as possible, and products from Viking Mats made this possible. Get inspired before you embark on creating your own wetlands crossing.